TapperSciences FitSound3 bluetooth headphones will give you superior comfort and rich sound quality for music, YouTube, Netflix, phone calls, and more. We designed our product for people who want a high performing headphone with deep bass and full ambient sound, yet a small, lightweight footprint they can take anywhere. Tapper wireless earbuds will stay on/and in your ears and will work even when they're wet. Whether you're an avid athlete, working at the office, or you're watching videos on a tablet or wireless television from across the room, our wireless headphones will change the way you live. 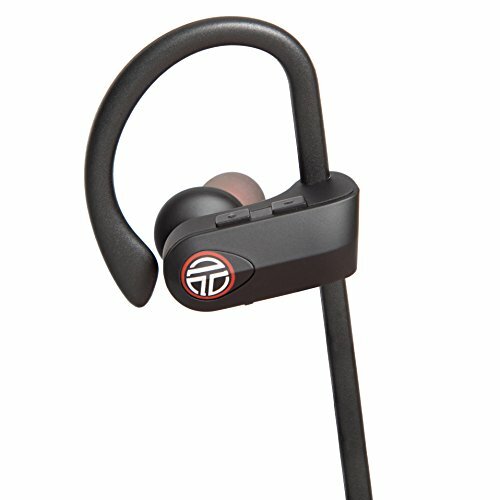 That's why we developed TapperSciences Wireless Bluetooth Headphones, with non-slip over ear comfort and flexibility, soft in-ear noise cancelling silicone earbuds, a built-in noise canceling microphone and hours of playtime so you can run, cycle, lift, workout at the gym, or go about your day without leaving your music and beats behind! Waterproof IPX7: Rain? Yes. Heavy splashes? Yes. Use in the shower or bath? Yes. Scuba diving? No. Change the way you live-- go wireless now by clicking 'Add to Cart' or 'Buy now' above. ✔ As featured in the Wall St. Journal, these are the popular wireless headphones that were repeatedly sold out on Amazon. We will be back in stock Feb 24! ✔ DESIGNED IN CALIFORNIA, FULL ONE YEAR WARRANTY: We're a rapidly growing company in California, and we provide superior US-based support and a full warranty on our products. If there's any issue with the product, we'll either remedy it or replace it-- we want you to have an outstanding customer experience. ✔ APPLE iPHONE, ANDROID, and TV COMPATIBLE: Connect to any Bluetooth device or phone (iPhone 6, iPhone 7 plus, Samsung, etc. ), tablet, PC, television, Apple Watch. Soft in ear silicone earbuds include 3 different size earbuds to enhance in-ear comfort and sound quality. Volume controls directly on headset for volume adjustment, song skip pause and play, and answering phone calls-- all from headset. ✔ SUPERIOR AUDIO & BASS: Deep, rich sound in a small footprint-- you'll never want big headphones again. Our wireless earbuds use a Qualcomm CSR chip with full ambient sound, deep bass, crisp beats, clear treble, and available loud volume for running, exercising, hard workouts, or the gym. Superior HD sound clarity and passive noise cancelling earbud design let you hear your own music and phone calls instead of external noise. Compatible with Siri, Google voice w/ built-in mic. If you have any questions about this product by TapperSciences FitSound3, contact us by completing and submitting the form below. If you are looking for a specif part number, please include it with your message.